Next Saturday, I join 30+ performers in a 3+ hour performance to celebrate the talent and imagination of Seattle's dance scene. 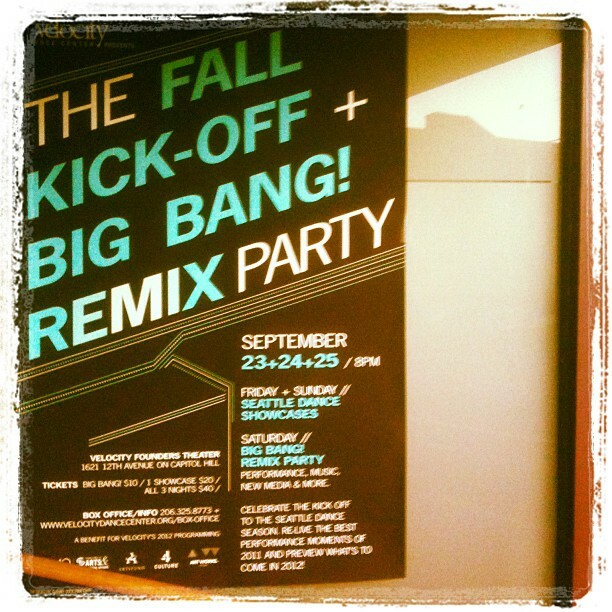 The Big BANG Remix is part of a weekend of events to benefit Velocity Dance Center. Here are some of the performers: Adam Sekuler, Haruko Nishimura, Byron Au Yong, Belle Wolf, Ezra Dickinson, Kate Wallich, Kelly Sullivan, Rosa Vissers, Karn Junkinsmith, zoe|juniper, Serge Gubelman, Stimulate Dance, Anna-lizette Conner, Douglas Ridings, Karin Stevens & Craig van den Bosch, David Wolbrecht, Eric Pitsenbarger, Markeith Wiley, Colleen McNeary, Jenna Bean Veatch, Lou Karsen & Stefanie Karlin, Maya Soto, Kristen Tslatslos, Rachel Grant, Amy Johnson, Erica Badgeley, Molly Sides & Vanessa DeWolf.